Our leather choke free dog harness is made with your dogs comfort in mind. You can stop your dog from gagging and choking with our leather choke free dog harness. This leather harness is better because you can walk your dog or cat without causing pressure on their neck. The proven unique easy on, easy off design with velcro closure allows you to step your dog or cat in and wrap the harness around the dog and go! This leather harness is available in our traditional signature leather, faux Croco leather or faux Ostrich leather. Size 13 and 14 are $22.00. Size 15 and16 are $23.00. Size 17 and 18 are $26.00. Size 19 and 20 are $28.00. Size 21 and 22 are $30.00. Size 23 and 24 are $32.00. Size 25 and 26 are $35.00. Size 27 and 28 are $38.00. Black Crocodile, Pearl Crocodile, Chocolate Crocodile, Red Crocodile and Mocha Crocodile. This item usually ships out within 2 to 3 working days. Metallic colors take a little longer. To get the correct size, measure your dog or cat just behind the front legs, go all the way around the dogs body. Sizes 9, 10 and 11 Usually fits Brussels Griffon, Chihuahua, Maltese, Shih Tzu, Toy Poodle, Teacup Yorkshire Terrier and cats. Sizes 12, 13 and 14 Usually fits Miniature Dachshund, Pomeranian, Silky Terrier and Yorkshire Terrier size dogs. Sizes 15 and 16 Usually fits Beagle, Bichon Frise, Boston Terrier, Cairn Terrier, Cavalier King Charles Spaniel, Lhasa Apso, Miniature Poodle, Miniature Schnauzer, Papillion, Scottish Terrier, Welsh Terrier and West Highland Terrier size dogs. Sizes 17 and 18 Usually fits Cocker Spaniel, Corgi, Pug, Standard Dachshund, Welsh Corgi and Whippet size dogs. 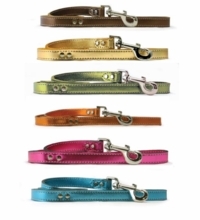 Sizes 19 and 20 Usually fits Bedlington Terrier, Border Collie, Kerry Blue, Tibetan Terrier and Wheaten Terrier size dogs. 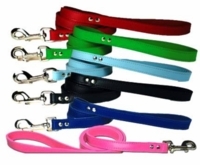 Sizes 21, 22 and 23 Usually fits Australian Shepard, Bull Terrier, Chow Chow and Shar Pei size dogs. Sizes 24 and 25 Usually fit Bassett Hound, Blood Hound, Brittany Spaniel, Dalmatian and Doberman Pincher size dogs.